Some ten years ago, we all went to a cousin’s place for a family dinner. She was making a beef roast with marinade. However, when we came, and I went in the kitchen with her to help, the meat was just sitting there on the table raw. There was only a big syringe next to it filled with marinade. So, I watched her do her magic with it and in the end, the roast beef she made never tasted better. Of course, I asked her how. I had to know the secret. She told me all about injectors for meat and where I can get one like hers. I got one right away, and my boys were licking their fingers next time I made a roast. Today, meat injectors aren’t as big secret as they were before, and many skilled chefs utilize this handy device to make impressive meals. You should definitely try it. Here’s what you have to think about when looking for a meat injector. What is a meat injector and why do we use it? A meat injector is usually a big syringe with a special needle we use to fill the meat we want to cook with marinade. We basically marinade the meat from the inside out. During the cooking, the meat can dry, and even lose its structure. Injecting is an efficient way to add flavor and moisture to the meat we want to roast, barbecue or grill. If done right, the meat will just soak up the fluid together with salt, oil and some spices. Your final product will be a delicious and perfectly juiced meal that you family will want to eat all the time. Let's compare different kinds of meat preparation so I can better explain what injecting does for the meat. Marinating is a process of soaking pieces of meat in liquid seasoning. The pieces are usually smaller in size so they can absorb the flavor better, but even then, it might take quite a while (sometimes even a couple of days) for it to be done right. And if it is a bigger piece then the meat only soaks the fluid on the surface. The middle will stay bland. The container needs to be plastic or glass because metal reacts with the acids from the marinade and it needs to be kept in the fridge because of bacteria. Brining is used mostly for poultry. It’s a process where a whole chicken or turkey is submerged in brine or marinade in a plastic bucket or container and is left like that till the meat absorbs the flavor. It takes quite a time to do this and space in the fridge to keep it safe from bacteria as well. It is, after all, a whole poultry we are preparing. But even submerging the meat doesn’t guarantee you that the meat will soak all the way to the bones on the thicker parts. What separates injecting from these is that no matter what kind of meat we use, it takes only an hour or two the most for it to be ready to roast or barbecue. Sometimes, no need to wait at all. Thanks to that, there is also no time for bacteria to do any harm either. We inject the marinade with a needle deep inside in small amounts, and the meat absorbs it evenly. In my opinion, this might be the most practical and fastest way to add some flavor to our roast. As I said already, a meat injector usually looks like a big 2 to 4-ounce syringe made of plastic or stainless steel. They have a steel needle that can vary on the openings it has (some have only one at the end, while other have more evenly placed holes) and the width (for fluids you use a thinner one, but for injecting something thicker, like pesto, you use a wide mouth injector). Some restaurants use a food-safe jug (1/2 or 1 gallon in volume) with a pump that has an injector with usually 1-4 needles. But that is just too big for a typical household. After you finish using it, you need to clean it properly. I advise you to wash the injector by hand with a cleaning brush under a stream of warm water with some dish detergent for oil residue (if you used it in the marinade). I do not recommend washing it in a dishwasher because the streams inside can damage both the syringe and the needles, and they won't be cleaned properly either. Letting them dry is also important because any moist left inside can be a source for developing mold or bacteria. Once dried, smear some vegetable oil on the rings inside so the plunger doesn’t become stiff. You start with preparing the marinade you want to use. It would be best if it doesn’t have any leafy or chunky ingredients in it because depending on the needle you want to use it might clog it up. Usually, the marinade is some oil-based mix or melted butter combo with spices. It can even be some alcohol like cognac or whiskey. 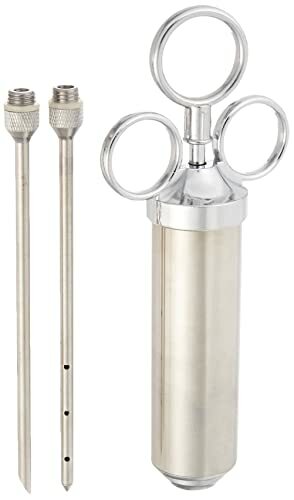 Tip from Barbara: Before using the meat injector, you should always smear some vegetable oil on the ring for easier use, so the plunger is not stiff while injecting. You fill up the syringe with the marinade and depending on what type of needle you are using you have two ways to prepare the meat. First is with a standard needle with an opening only on its end. You inject the meat and disperse the fluid gently. To minimize the number of holes, so the fluids don’t leak out, you might want to try using the same hole but changing directions of the needles 3-4 times. The second one is with the many-holed needle and is much easier to do. On an even distance, you inject the meat by pushing the needle deep into the meat and slowly press the syringe. The holes of the needle will place the marinade in right places so no need to change directions. For best result, I always leave my meat an hour or two in the fridge so it can soak up the flavor. 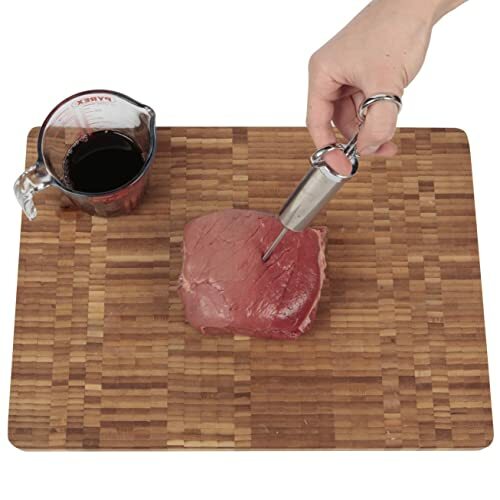 Once I started using the meat injector, I could not just go back to not using one. I have an excellent reputation of experimenting with various marinades and tastes for our Sunday family meals, so I spared no money and got five meat injectors that looked very promising. It took me two months to test them properly in various situations, and this is what I can tell you about each one of them so far. On the first look, this stainless-steel 2-ounce meat injector feels good when you hold it in hand. Being not too heavy, it seems to be quite practical and easy to use. But to be honest, for someone who has a bit smaller hands like I do, it can be tricky to handle. It is sturdy enough, but I did have to make an effort to finish using it. While the syringe and needles are made of stainless steel, the handle and the screw cap are not, so you might need to pay a bit more attention to cleaning and drying. It says in the manual that you can wash it in a dishwasher, but I would not recommend that. 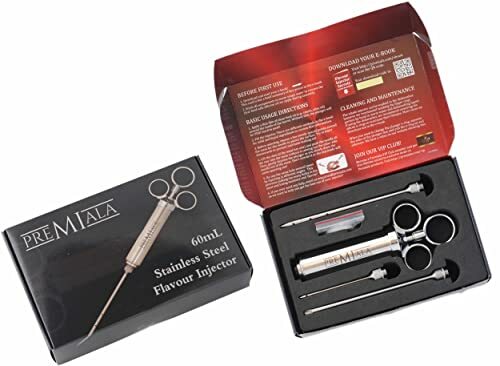 This injection kit comes with three needles, a 3-inch and two 6-inch ones of which one is a 12-hole needle, and the other is a wide-tip needle for chunky marinades. However, when I tried using the chunky marinade, the wide one still clogged. Also, be careful when you screw in the needles because it could cross-thread, be crooked and leak. It comes with a lifetime guarantee, and if you don't like it for some reason, they will give you your money back. You even get an eBook with tips, techniques, and advice on how to use it for beginners. I found it a bit disappointing though, because on the first use the cap would just not stay put. I had to work for it to close and then as I was pulling the plunger out, it came off again. It’s also a shame that this meat injector only comes with two 6-inch needles. There is no short one for smaller pieces of meat. The needles look good, but they are not wide enough for marinades with seeds or chunks inside of them, so I did not even test them with something like that. But when I was using the needle with holes, I noticed that the holes are placed too high up. I had to insert the needle deep into the meat to inject the marinade right. However, there is no note on any warranty or return money policy if you are not satisfied with this product, so if something happens with your Bayou injector, I suggest contacting the manufacturer. To be very honest with you, I could not find any objections or problems in using this product. The packing was decent, and weight of the injector itself gives a nice feeling of a sturdy and reliable utensil. It’s made from food-safe good quality stainless steel and even comes with spare silicon rings. This kit comes with three needles. A short 3-inch-one and two longer 6-inch ones, one of which has several holes. If cut small enough, these needles don’t have any problem injecting meet with marinade containing garlic, rosemary or some other spices. You also receive an eBook with tips, bits of advice and recipes of how best to prepare a meal which is suitable for beginners. 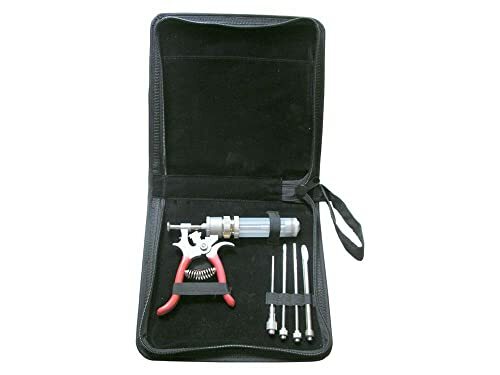 This meat injector kit also comes with a 12-month guarantee with an option to prolong it to a lifetime one if you become a VIP member, which is not a bad deal at all for the price you can get it. Comes with an ebook with recipes, tips, etc. What I can tell you right from the start about this 2-ounce Mr. Grill meat injector is that the price is very affordable. However, you get a product that has an average quality. Even though it says it is stainless steel, the handle is chromed hard plastic. So, in a way, I do expect it to break soon. The handling was a bit hard, to be honest. Even though I put oil on the plunger, it was still a bit difficult to pull back and draw marinade into the syringe. There are also no extra O-rings included in the kit, so if yours wears off or breaks, you will need to order or buy a replacement one. The two different 6-inch needles you get are quite decent and function better than I thought they would. It’s a shame there is no third short one. I even managed to inject thicker marinade with it and held up well. It comes with a 12-month warranty, and even though it says it's a dishwasher safe one, because of the plastic handle and reasons I mentioned already, I would still wash it by hand. The reason I left this one for the last review is that this model is different from others in looks and the price. This one costs more than all the other injectors together. You know how the saying goes "you get what you pay for"? I do think it might be overpriced after all, even with the cute zipped bag. I can't deny that it was fun using it and easy as well. It hardly takes any pressure to inject the meat with it, and you finish so fast. I could even adjust the flow and the amount of marinade I wanted to insert. It looks like a gun so you just poke and squeeze and that is it. When my hubby saw me with this injector in my hand, he told me to be careful where I point it. This kit is well-equipped and comes with 4 different types of needles (a many-holed one, a long one for a bit thicker marinade, an over-sized opening needle for bigger chunks and a small thin one for smaller pieces of meat) and a cleaning brush as well. You would think it might be complicated to clean, but it is surprisingly very easy to do. Just don’t put it in a dishwasher. And it even comes with a 12-months warranty in case something happens. I will be honest with you and admit that I used the SpitJack Magnum Meat Injector Gun the most in these two months of trial period. It was very practical and saved me time with preparing the meat for roasting and grilling, leaving me more time for something else to do in the kitchen. 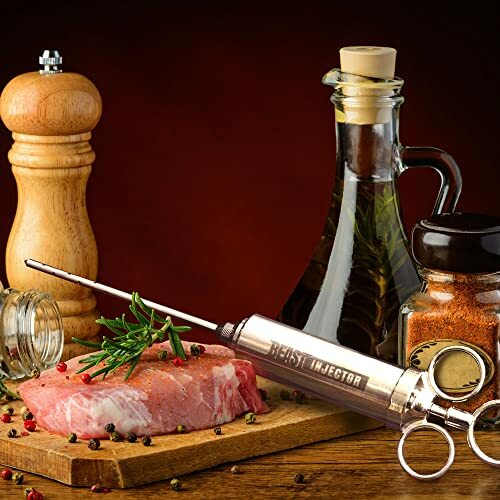 There is an issue with the price however so if this one is way over your budget, I have to recommend the Premiala Awesome Meat Injector. It was great to use, and I found no significant problems in handling if you follow the instructions correctly. The eBook with tips is a great addition to it as well. No matter which one you end up using, there is no doubt you will enjoy eating a well-prepared meal.